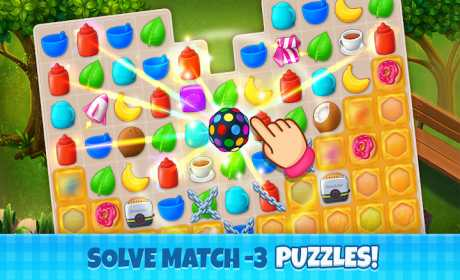 – Swap and match items to beat uniquely designed match-3 levels! 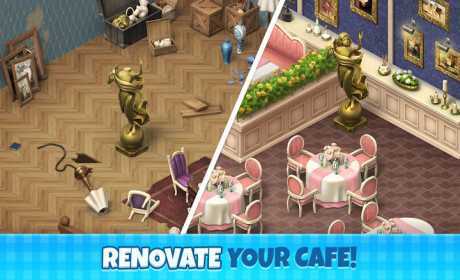 – Show your design skills and renovate the restaurant with awesome decors! – Uncover and be a part of an exciting story with many interesting characters! – You can play Manor Cafe offline! – All this fun-filled adventure is FREE! You had one dream when you bought this old and outdated restaurant mansion: bringing its full glory back by decorating and re-opening all the beautiful parts like the bar, dining hall and the garden. Meet Meg the restaurant manager and Bruno the angry chef. Play and beat match-3 levels and earn stars to decorate your cafe. Uncover the intriguing story as you move, meet exciting characters, and unlock tasty foods! If you’re a fan of puzzle games and home design games, Manor Cafe is just the game for you! Matching items has never been more fun! Among all the match-3 games, Manor Cafe has a special place with tens of powerful boosters, super power ups and unique storyline, funny characters and the lively atmosphere of an open restaurant! You’ll never live a dull moment in Manor Cafe! 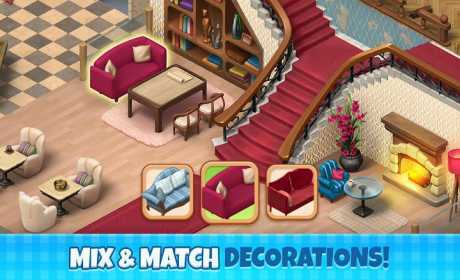 What makes it different than other cafe games and match 3 games is not only the exceptionally gorgeous decor items or the delicious food menu, but also the unique gameplay that merges match three and decoration!